Govardhan Puja 2018 Muhurat Timings & Annakoot Pooja Vidhi: Goverdhan is celebrated on the very next day of Diwali aka Deepavali, the festival of lights. It is also an important event in the course of 5-day festivities of Divali celebrations. Devotees worship Lord Krishna today and offer him a variety of food. It is said that Krishna preserved and protected the entire Vrindavan region from Indra Dev as he caused heavy and dangerous rainfall which could had killed everyone. God used his little finger to lift the huge Govardhan Parbat, and everyone saved their lives by taking shelter underneath it. Indra sent the torrential rain out of jealousy and anger. It is observed on the third day and this year; it falls on November 8. This auspicious occasion has an interesting story associated with it. It was basically an ego clash. 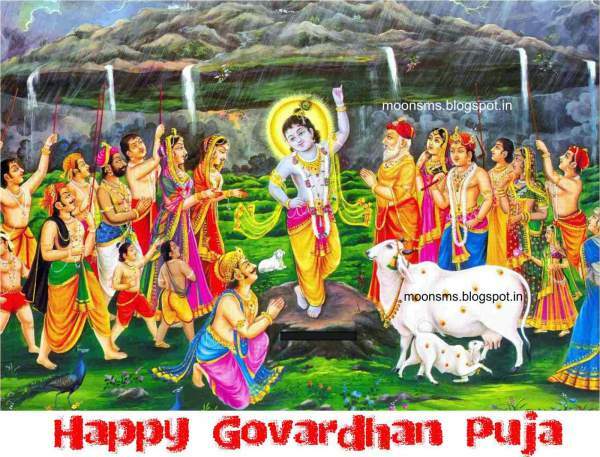 Share: Happy Govardhan Wishes and Images. Bhagavad Puran states that people living in Vrindavan forest regions used to worship Lord Indra during the autumn season as thanks for bountiful rains and good harvest. Krishna, the incarnation of Lord Vishnu, convinced people that they need to worship someone closer rather than a distant God. As he convinced them and prepared a mountainous offering of food and delicacies for a ‘giri yagna’ to offer it to Govardhan. Soon, the news of people, now, worshipping reached to the god of rains and he became upset and furious. Thus, he decided to punish all the villagers and sent a storm and torrential rain for days. People got scared and feared for their lives and thus, sought help from Krishna. Then, he guided everyone to go to the Govardhan mountain for protection. Krishna lifted the whole hill and asked everyone to come underneath. Thus, he saved everyone from the wrath of Indra. Indra got tired of trying to hurt them, but, at last, he accepted his defeat as he realized that whatever he did was out of his ego. After that, he cleared the storm, and everything became normal. Since then, Govardhan Puja has become a tradition in northern states like Punjab, Uttar Pradesh, Haryana, Delhi, and Bihar. People who can go directly to the Govardhan hill, they circumambulate the hill and offer food and delicacies as a way to thank Krishna for his blessings. 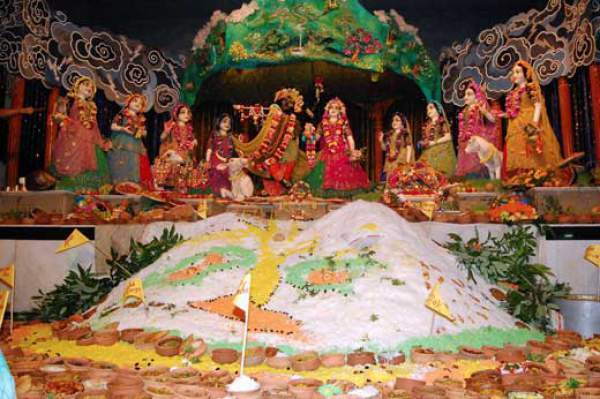 The devotees celebrate this day by making a mountain of food which is known as the Govardhan mountain or Annakoot. People perform the pooja and offer prayers with devotion and ask for forgiveness. Also, they light diyas (oil lamps), decorate houses, design rangoli with colored rice and flower petals. The way of celebration and conducting puja differs with regions, and it is an essential part of every pooja and festival. At many places, people place cow dung to represent Govardhan mountain and decorate it with flowers. In the evening, they worship and rotate around it. The Annakoot is made by preparing huge quantities of vegetarian dishes. All of the sweets and dishes are offered to the deities. At many places, the ‘chhappan bhog’ is made as it contains 56 dishes which are offered to God. Some people conduct Goverdhan puja both in the evening and morning. Below are the shubh muhurta timings to do and have a hardle free and blessed pooja. At several places, Vishwakarma Puja is also done. People pay their tribute and due respect to their tools and machinery. Also, people worship ‘Vishwakarma,’ the divine architect on this particular day (dedicated to him). They pray for the smooth functioning of their machinery and tools.